The Canadian Government has just issued a travel warning to Haiti because of a sudden rise in violence and political instability. This new crisis comes on top of pre-existing risks and threats which caused men, women and children of Haitian origin living in Canada to flee Haiti as asylum-seekers in the first place. In this context, we are outraged that Canada is continuing to threaten people with deportation to Haiti. If Haiti is not safe for Canadians, it is not safe to deport people there! People who came to Canada from the United States after Trump lifted the moratorium on deportations to Haiti, crossing irregularly because of the so-called Safe Third Country Agreement, are now quietly being deported in the thousands, out of the media spotlight. So many are being deported that CBSA is working overtime, even calling people in on Saturdays to get their deportation dates. Their refugee applications are being refused in proportions which once again demonstrate the injustice of Canada’s refugee system. Lawyers report not having the time nor the means to defend the interests of their clients. 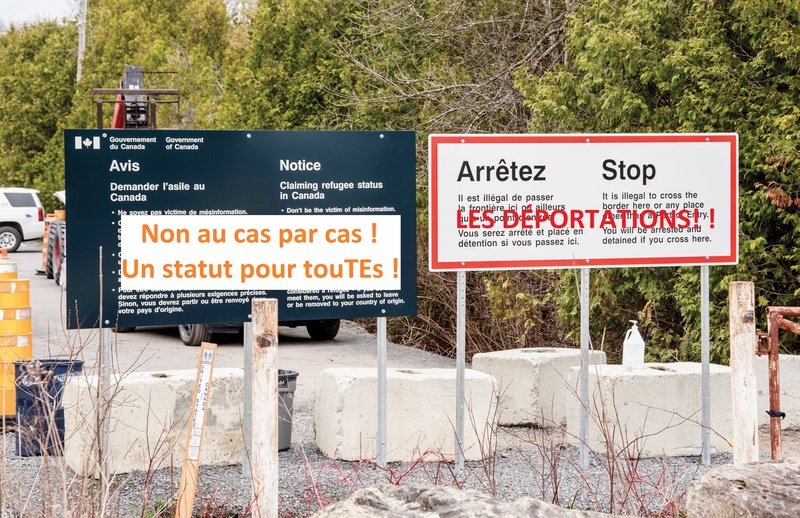 Some Haitian refugees were ordered to come to CBSA offices to “choose” a deportation date while their cases were still before the Federal Court. Forced to show up on Saturday, many come without a lawyer or any accompaniment and are all the more easily pressured into “agreeing” to deportation before exercising all their legal recourses or to outrageously short timeframes for deportation such as two weeks. Others have been detained while awaiting deportation; the Laval Immigration Detention Centre is reportedly now full of people. Whole families live in fear of being once again uprooted from their lives, friends, work. In desperation, others do not show up for deportation and remain in the shadows as undocumented migrants, prey to exploitation and living in fear of arrest and deportation. Join us in front of the CBSA offices at 1010 St-Antoine on Saturday, July 21, 2018 from 10:00am to 12:00pm to demand an immediate moratorium on deportations to Haiti. Stop deportations! No more case-by-case! Status for All! ALL Refugees Welcome!